Why would you predict the world of tomorrow? What will technology bring next? And how will it impact people? These were some of the questions that were asked at a Government backed workshop I attended aiming to provide a framework in which to answer the questions with predictions, shaping the strategy to build an Australia of the future. The word ‘futurist’ as it appears in english books since 1800. Before the workshop, I had always doubted the usefulness or purpose of predicting technology, believing it was the domain of only so-called ‘futurists’. In fact, we’ve been attempting to do it since at least the 1800’s when the term, futurists, started to appear. Since then there has been a wealth of literature on the subject. Foretelling the future was the once the realm of sorcerers, witches, artists and writers but it’s now become a very important part of business with some of the worlds largest consulting groups, companies and ‘Twitterarti’ instilling their own forms of ‘future predictions’ and its impact on their businesses. Let me start by acknowledging I’m not an expert or self-proclaimed futurist, more of a interested bystander with a natural inclination to ponder about the future and what might be. Simply, these are some of the important questions to consider before you embark on your own future scenario considerations, and take real-life action! The important thing is to separate technological progress prediction (i.e. Moores law) and human behaviour (i.e. utility and impact of this change). As a side note, people have been complaining about the pace of life for centuries. 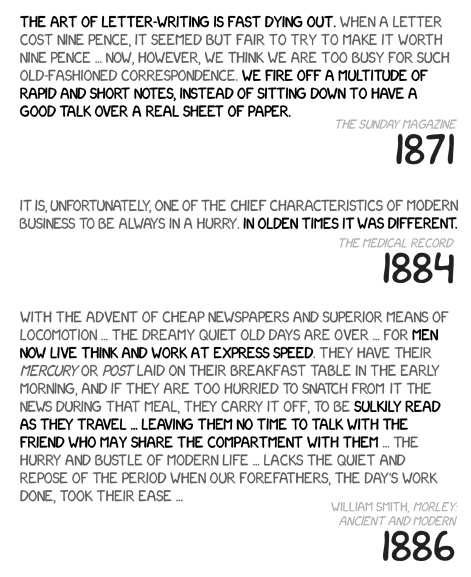 ‘The Pace of Life’ comic by XKCD. Then there’s the why. Are you just bored? Do you want to stir the pot and make some crazed claim about The Singularity happening next year? Or do you have to identify new opportunities in new markets for new products? The fallacy of total revolution: new technologies will utterly change everything. This is a very important point to consider. While technology can have a profound impact on us, it’s highly unlikely to completely change our daily behaviour and life straight away. Indeed, you could argue the advent of mobile phones has done just this but in many respects it has just enhanced our existing ways of doing business and pleasure. The fallacy of social continuity: the technology will change, but society will continue as before. The fallacy of the technological fix: technology is designed to solve a problem and it will be solved, and in doing so it will not introduce any new problems. Perhaps one of the most potent examples of a ‘great prediction’ is that of ‘smarter’ phones and what this would mean for technology industry. In 1994, Australian researchers predicted the convergence of technology industry and mobile computing. “The personal communicator is a whole lot of things, all boiled into one. It’s called a Hypertel…it’s a mobile phone, but, of course, it includes a radio and television, a GPS with a map locater and a pretty fancy computer and a few other communication bits and pieces. The whole thing only weighs 150 grams. This model also has voice recognition and noise cancellation built in. Mind you, this one is not the “Rolls Royce” model. It’s a bit up-market from the base model, but not terribly so. An enormous range of services are available now…I’ve paid for the full radio and TV service and the full mail service. Phone, remote banking and remote shopping are included in the base charge. I have a library subscription, as well. that lets me access any book, picture or video material that is avail­ able within the Australian library and museum system. Close, but not quite an iPhone. 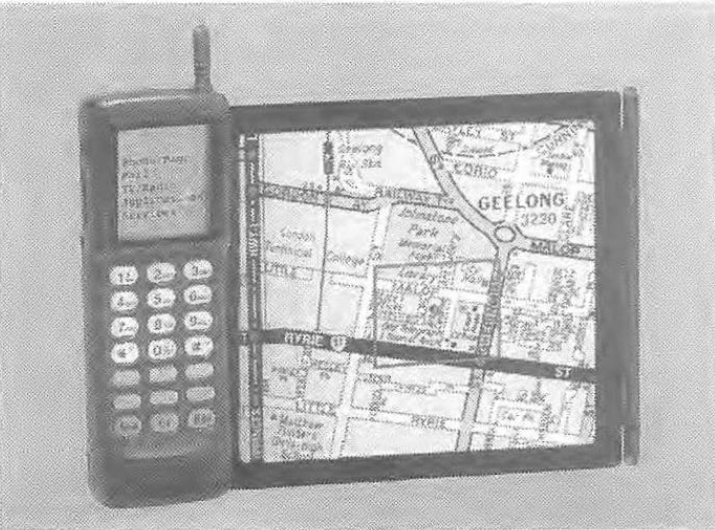 Hypertel showing a street map — they successfully predicted the core functionality and utility. Convergence: By the year 2020 information technology, telecommunications and entertainment systems will have merged. It was a pretty incredible set of predictions that today ring true in many ways. Moving forward a few more years, I believe founders tend to make some of the best ‘futurists’ out there. They usually have a vision of a world that has not yet eventuated grounded on building real value in the present. FedEx was the pioneer of centralised, global courier services with cars, jets and distribution centres and even back in 1999, he recognised the partnership with brick-and-mortar grocery stores was the future. History is also littered with terrible predictions that seem absurd today. In hindsight, everything would of been done differently so it’s much better to look at the behaviour and compensate for that. People usually underestimate the potential for change and I posit that this is truer when you start involving industry experts. As Howard Marks notes, general projections into the near future tend to “cluster around historic norms and call for only small changes.” The point is, people usually expect the future to be like the past and underestimate change. Best and worse can translate into many different things in different contexts. Be careful who you listen to when validating your strategy for the future. 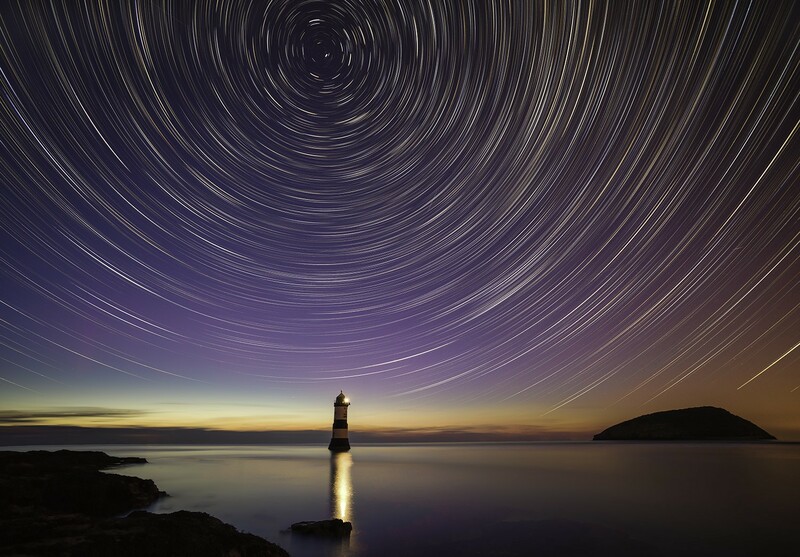 Solstice Stars by Kris Williams. In this one prediction Kepler justified to Galileo their motivations for mapping the skies. Even though it would be centuries after their work (and even a spacecraft named after him), he correctly predicted that human behaviour would advance both technology and skill to be able to explore the skies and space. Ultimately, Kepler’s vision inspired life-long work that would provide one of the foundations for Isaac Newton’s theory of universal gravitation. I believe, predictions of the future should inspire strategy, leveraging off vision. Technological predicting has been happening for a while and the benefits can be very interesting if informed predictions are taken seriously and meaningful action taken. Predictions should influence strategy and one of the best examples is to take a look back to 1994. 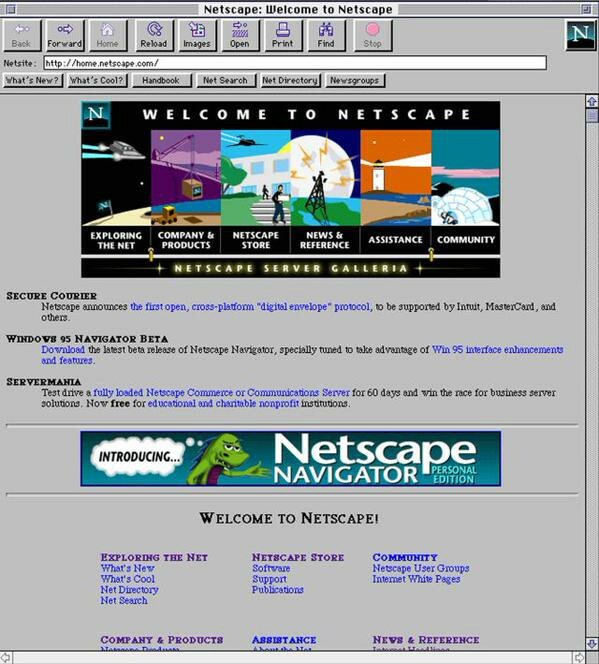 In Silicon Valley, KPCB, a renowned VC firm based in Silicon Valley, paid $5 million for around 25% of Netscape — one of the worlds first web browsers developed my Marc Andreessen. Otherwise we’ll be left behind in a world dominated by technology, where companies will be able to play on a “global stage”. Fast forward and KPCB hugely profited from Netscape’s IPO, which set off the first dot com boom, and subsequent $4 billion acquisition. Netscape influenced the development of the world wide web in profound ways and its founder now runs one of the most influential VC firms, Andreessen Horowitz, which invests in the next generation of technology entrepreneurs from around the globe. Meanwhile, in Australia we’re seeing stagnation in Computer Science enrolments, declining resources sector and a sharemarket struggling to perform as predicted from the 2008 financial crisis. Meanwhile the very companies that KPCB funded years ago have become more valuable than our most recognised household names — Facebook is now worth more than BHP, Commonwealth Bank (one of Australia’s leading banks) and Woolworths (one of Australia’s leading grocery companies) combined. Complacency is a killer and I think the Australian catch-cry “She’ll be right mate” is the perfect embodiment of how not to treat informed predictions. Ultimately, I believe predictions of the future should not be ignored but motivate individuals to work towards a world they want to see, it should inspire strategy and leverage off their vision. The world of tomorrow is built by us today. This article was written by James Alexander, Co-founder at Galileo Ventures to invest in under 30s & INCUBATE, Australia’s largest university startup accelerator.